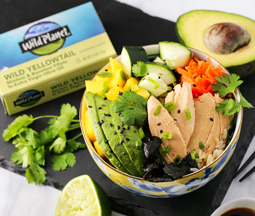 Poké-Style Yellowtail Bowl - A recipe from Savor California, the online showcase for extraordinary gourmet foods and beverages from California. Soak dried wakame seaweed in hot, boiled water for about 10 minutes. Drain, squeeze out excess water, and set aside. Place hot cooked brown rice into bowl. On top of the rice, arrange yellowtail fillets, sliced avocado, mango, cucumber, carrot and seaweed. Over it, squeeze half a lime and sprinkle the cilantro and black sesame seeds. Finish with soy sauce to taste.